Artists who made the statue were Frédéric-Auguste Bartholdi, Alexandre-Gustave Eiffel (frame), and Richard Morris Hunt (base). 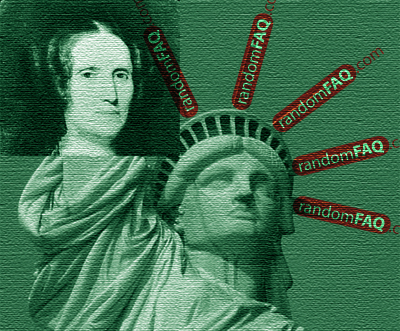 Charlotte Bartholdi, depicted next to the statue, is as you may have noticed by the name, the artist's mother. The resemblance seems to be in the nose. Another possible model is Isabella Eugenie Boyer wife to the sewing machine mogul Isaac Singer. Before the statue was designed, Bartholdi proposed a statue for Egypt. A lighthouse in the shape of a Roman goddess, Libertas with similar qualities to the statue in New York Harbor today.